Home > News > British cars > McLaren Grand Tourer ditches cladding: Update! In the run up to the reveal of McLaren’s Grand Tourer this May, the Woking brand has put out more images of its development car – but this time it’s lost cladding and wears only a shrink-wrapped camouflage. It means for the first time we’re able to see the form of the car's skin, which appears to mix 570S, Longtail and Speedtail features, probably to emphasise a combination of some of their performance traits. McLaren has pledged that this standalone model – it won’t be part of any of the brand’s existing Series – will set new standards in the world of performance grand tourers. 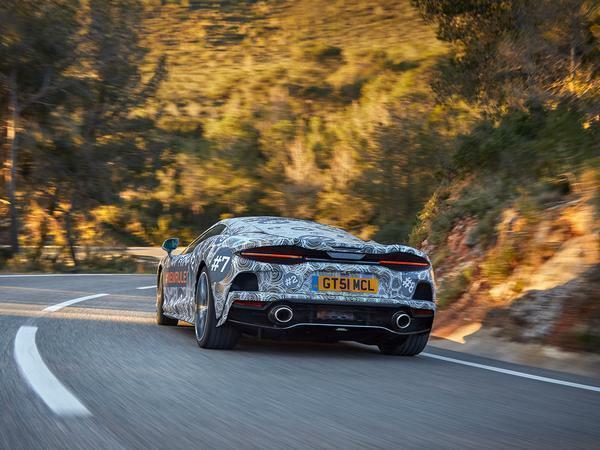 As part of its efforts to achieve this, the test car has been sent on a 1000-mile road trip from McLaren’s continental development base near Barcelona back to its Surrey home with two occupants on board, who’ve brimmed it with luggage. This is all in the name of endurance and refinement testing and not just an employee jolly up, although it does sound rather fun. The occupants will be in constant communication with HQ, evaluating the Grand Tourer’s vitals and also reporting back on their conditions – McLaren’s long-distance performance machine can’t be giving anyone sore backs, can it? Particularly when interested buyers are said to be existing customers who have praised the 570GT’s touring abilities. Excluding the Longtails (because they're limited), there's an argument to say that the 570GT is the best Sports Series McLaren. It loses little to the S dynamically (and that can be restored with a handling pack), while offering some welcome added style, luxury and sense of occasion. It's not been lost on customers either, apparently, the majority of whom are conquest buyers from other manufacturers who haven't had any McLarens previously. How does that relate to this? Because those customers who have a GT have told McLaren that they love the car, but quite like the idea of something even faster and with its own distinct style - hence the 'McLaren of Grand Tourers'. That really is the name for now, a full title set to follow in due course. Teased only with a video at the Geneva show, it will be the fourth car in McLaren's Track25 business plan (where 18 new cars are coming before 2025) and isn't part of the existing Sports, Super or Ultimate Series families. CEO Mike Flewitt said to expect "competition levels of performance with continent-crossing capability, wrapped in a beautiful lightweight body." The line at present is that this car will "redefine the rules of grand touring", implying a car along Speedtail lines where refinement and comfort are the priorities, albeit still with plentiful performance. It's said this McLaren will be the most usable mid-engined car yet, too. The new GT's silhouette, even disguised in a testing video, is something to behold; of course it's difficult to be sure for now, but it seems both wider and lower than even a 720S. One to investigate further once the hype dies down. But McLaren certainly isn't resting on its laurels, that's for certain - more as we have it! McLaren seem to be using the porsche business model or many variations on a theme and frankly why not customers like buying a model rather than having to pick endless options to get car you want. They still cater for the later with MSO too. For me I see this as a chance one day to own a real super car for less than say 60k (if the 540 depreciated that much over 10 years). I wish them all the best with this. So where will this fit in with amongst the current range? Confused. If it is pitched at the same level as 720S or lower than that would make for interesting reading but if it is another unobtainable option like Speedtail or Senna my interest tends to drop off. I hope they do well in this market, but I am not so sure they will be able to produce a proper GT as good as, say a Bentley CGT, or at the upper ends of the market, Rolls Royce Wraith. Although I guess if they're going after the Aston Martin DB11 I guess it could work. Suppose it depends on where on the spectrum of "GT" you want your car....luxury or more sporting? Why is it driving on the right?